Lois Moses, performing "And They Jumped Into The Water" from, "Say That He Had More Than A Dream..."
Lois Moses, writer of "Say That He Had More Than A Dream"
Playing to a standing room only audience, “Say That He Had More Than A Dream” connected the backstory of Reverend Dr. Martin Luther King, Jr.’s efforts with the contemporary mainstream ideas concerning Black Lives Matter. Written by Lois Moses and directed by Zuhairah McGill, this staged adaptation featured a stellar cast and combined music, dance and theatre as a cultural platform. This play made its preview on a Pennsylvania College campus last year before coming to Philly to kick-off a national tour. This time around, the wonderful cast featured Ron Lee Jones as King, Sara Osi Scott as Coretta, Jaron C. Battle as Stokely Carmichael, Chorus members Nicole Stacie, Nastassja Baset and Sanchel Brown. Choreography was triumphantly portrayed by with Charles Tyson, Jr. with music by Karen L. Smith and stage management by Janice Jenkins. The play is being staged at West Philly’s cultural mecca Community Education Center at 3500 Lancaster Avenue and ends this weekend with performances from October 7th-9th. For more information contact 267-939-9012 or www.firstworldtheatre.com. People of all colors, ages and political affiliations were easily engaged with the racial elements displayed in this very engrossing and emotional performance piece. There were issues and answers presented in this production that have been long overdue and now resounds as a public address. Attendees were touched with primal laughter and brought to tears while learning about the trials and tribulations of what ails America. I really think this promising productions is worth its weight and gold and suggest that each and everyone hurry down to see it before it leaves town to go on the road less traveled. First World Theatre Ensemble will perform “Say That He Had More Than A Dream” by Philadelphia native Lois Moses from Sept. 20 to Oct. 9. 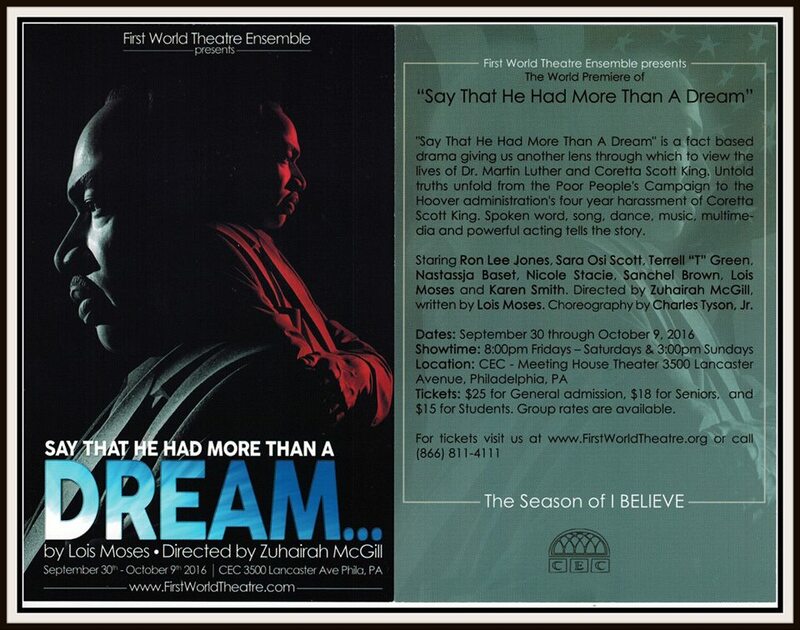 First World Theatre Ensemble launches its season of “I Believe” with “Say That He Had More Than A Dream,” a candid and insightful drama by Philadelphia native, Lois Moses. The premiere is directed by Zuhairah McGill, with choreography by Charles Tyson. It is playing Sept. 30 through Oct. 9 at CEC — Meeting House Theater, 3500 Lancaster Ave. The provocative piece, originally commissioned by Juniata College in 2015 for its Martin Luther King celebration, moves beyond the “mountaintop” as the play speaks to King’s transformation and presents another lens through which to view the lives of the Rev. Martin Luther King and Coretta Scott King. Through a multimedia presentation that includes spoken word, dance, and music, the drama from the Poor People’s Campaign to the J. Edward Hoover administration’s four-year FBI harassment of Mrs. King is revealed. “I am a performance poet, so you’re going to see a parallel of my poetry along with the conversation of his evolution in that last year of his life, where he makes the decision to speak out,” Lois Moses told the Tribune. “Basically, the characters are King, Coretta and Stokely [Carmichael], because I believe that Stokely is sort of that middle ground between Malcolm [X] and Martin, and Stokely is also a progenitor towards pushing him to actually reconcile his morality and his conversation to actually begin to speak out against the powers that be, and end this arena of racism, poverty and militarism, particularly,” she said. The multi-talented Moses, also an actress, lawyer, clinician and filmmaker, says that Zuhairah McGill, the bold and courageous founder of First World Theatre Ensemble, was instrumental in bringing her vision of “Say That He Had More Than A Dream” to the stage. “First World is committed to telling our stories through our voices,” Moses said. “I met ‘Z’ when she was doing Kimmika Williams-Witherspoon’s play, ‘Survival Strategies,’ so we have been working together on different projects. We did the Off-Broadway show of [Hurricane] Katrina in New York, so I’ve been working with her on and off with a lot of projects, and I actually brought her in to direct this piece at Juniata College because I love her vision and we work together so well. In addition to writing “Say That He Had More Than A Dream,” Moses will be taking the stage with a cast that also includes Ron Lee Jones, Sara Osi Scott, Terrell “T” Green, Nastassja Baset, Nicole Stacie, Sanchel Brown and Karen Smith. As Moses prepares to share her intriguing discovery and perspective on the life of King with a wider audience, she trusts that they will approach the piece with an open mind. “I charge them to be not bitter, but better in the end,” she said. “The last piece is called, ‘And They Jumped Into the Water,’ and what I want them to know is that we have to be the author of our stories and of our heroes, because when we allow victors to be the story, what happens is, there’s a holiday, there’s a stamp, there’s a bust, and so as a result, we experience him in a way that makes other people comfortable. “Our stories are not always comfortable, but they can inform us of not only what needs to be done, but also what has been done and what it cost in the end. Because for me, freedom is not free,” Moses added.